The word ‘barcode’ refers to a system of writing that consists of parallel lines and gaps of various widths and can be read opto-electronically. The term ‘code’ here does not mean encryption, but the representation of data in binary symbols. The data in a barcode is read mechanically using optical reading devices (scanners, cameras) and processed electronically. The familiar dual barcode label is now only recommended for LTO-1 and LTO-2. 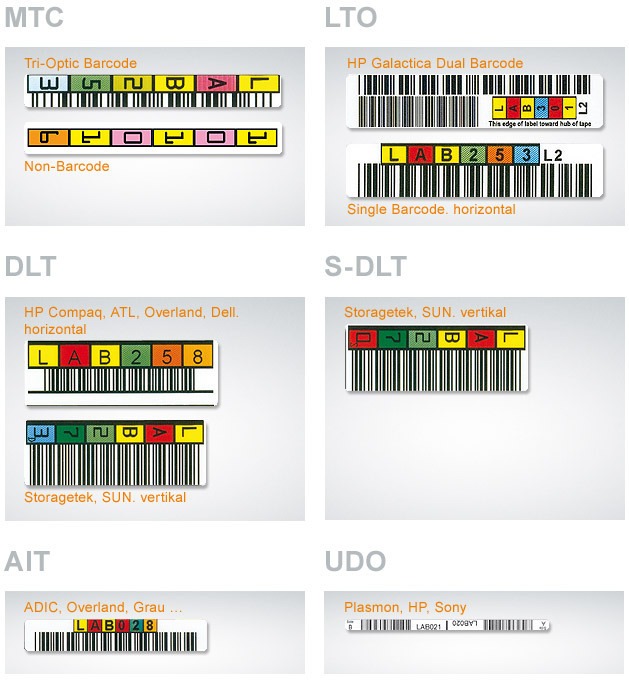 In future, only a single barcode label will be supplied for LTO-3 up to LTO-7. If you already have dual barcode labels in use and want to continue to use these for optical reasons, the dual barcode can still be supplied for LTO-3 up to LTO-7,but this must be mentioned additionally in the order.